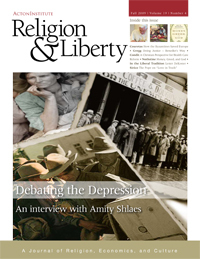 The new issue of Religion & Liberty features an interview titled “Debating the Depression” with noted columnist and author Amity Shlaes. Shlaes does a superb job at reminding us about some of the consequences associated with massive government spending and regulation. First and foremost among these consequences is the burden of debt and taxes we are heaping upon future generations. This kind of expansion, without the means to pay for it, will sadly have a negative impact upon the quality of life of future Americans. Another tremendous contribution comes from Grand Rapids orthopedic surgeon Dr. Donald P. Condit. Religion & Liberty has published an excerpt from his Acton monograph, A Christian Prescription for Health Care Reform. As we have seen, health care is an issue that inspires passion, activism, and tremendous debate, and it’s impossible to have a holistic understanding of this topic outside of a moral framework. The Acton Institute has been at the forefront when it comes to examining the moral implications related to our health care issues. Richards understands that for capitalism or free markets to succeed and flourish they must have a moral framework and hold a moral value for the believer. Even if one is, however, not a person of faith, it’s hard to argue against a need for a moral component for business and industry given the current economic crisis. There is more content in the issue, including commentary on Pope Benedict’s encyclical Caritas in Veritate. 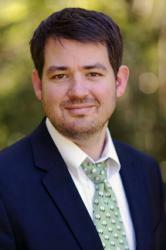 Lester DeKoster was profiled for the “In the Liberal Tradition” this issue. DeKoster was first and foremost a Christian man of faith, who while serving our Lord, defended the Church against Marxist liberation theologies. Which was just one of his many accomplishments.